expressing the inner thoughts, dreams, and humor of . First written by Casey Heinzism. If you would like to print or publish my works or share it by other means please write me for permission to do so. dnatureofdtrain@yahoo.com. If you want to share my works without writing to me for permission. Post the url/link to the website page of the poem, story, or content you are sharing, do not copy paste, or emb without permission. So they can read it ON site. You may not reshare any of my content on cyber bullying, harassing, threatening, or illegal content or adult only sites. Do to Health Issues, my websites and my store sales is the only way I have to earn so please respect the only way I have left to contribute to this world. "Do not be afraid to be yourself, or to open up to the world. You may open yourself up to scrutiny once in awhile.. But if we never came acrossed hardships we would not be able to prove to ourselves the strength we really carry. Remember to look for the answers within, more than without" - Rev. Dana C. L.
Note: all Poetry and stories linked below and linked to the links below unless it says otherwise is copyrighted and owned by Casey Heinzism "DNatureofDTrain". 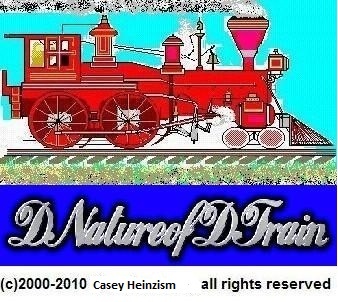 Note: some poems are older than this site, which is why some pages have two dates..
© 1993-2015 Casey Heinzism™ "DNatureofDTrain™" All rights reserved.